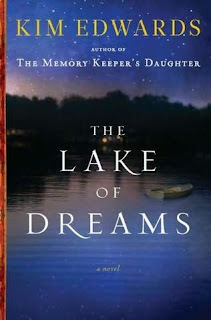 Returning to her hometown of Lake of Dreams, Lucy finds that her mother is considering selling the house to developers. Having been away for so long in Indonesia and Japan, Lucy is startled to find how nostalgic she feels towards her childhood home, and is overcome with memories of her father’s death years before. When she stumbles across some letters hidden in the cupola, she sets off to solve a mystery in her family’s history, which also involves a stained-glass artist and the women’s suffrage movement. Meanwhile, Lucy meets up with her old flame, Keegan, and wonders if there is still a connection. But her current boyfriend Yoshi will be joining her in the Lake of Dreams when his business trip is over. Their relationship has been a bit strained recently, which adds to her confusion. There is a lot going on in this book, between Lucy and her family, the proposed (and contested) development in the town, Lucy’s uncertain future with Yoshi, and her mother’s new budding romance. Added to that is the whole story of Rose Jarrett, a relative that nobody knew even existed until Lucy’s discovery. Despite all of the plotlines, the pace is steady and the story is told beautifully. Since I just finished a novel by Stewart O’Nan, who also writes wonderful descriptions, I can’t help but compare their styles. O’Nan’s writing reflects the world in all it’s smelly messy reality. There is beauty, to be sure, but there are also fast-food wrappers littering the floor of the car, and you may want to smell the milk before pouring it in your coffee. Edwards, on the other hand, creates atmosphere by including certain things and leaving others out. The air is fragrant with roses and there are always fresh strawberries. Lucy and her mother ate leftover party food for a few days and Edwards even made that sound classy (unlike when I do it myself and it is all stale and sad.) It is not a world that I have ever experienced, but it is beautiful to visit. Lucy’s main flaw was that she was so incredibly self-centered. For instance, she finds a long-lost relative who is 95 years old and decides to pay her a visit. She worries only about what she might discover, and never stops to consider that long-buried family secrets could be upsetting to a frail old woman. Similarly, at one point she calls her brother Blake in the middle of the night, waking him up with a piece of news that he thinks could have waited until morning. After he hangs up on her in anger, she doesn’t feel one bit guilty. No, she just moons about, thinking of the bats that have inhabited their yard since she was a child. 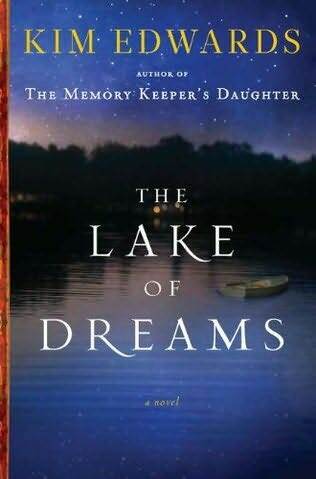 But this book IS all about Lucy and what her trip back to Lake of Dreams dredges up – discoveries, childhood memories, conflicting desires, guilt. Edwards found a good balance between action and thought, propelling the reader forward while adding moments of internal reflection, and wove it all together in a satisfying story that is a pleasure to read.